The emerging network of trails along the Chicago River presents a valuable opportunity to string together a 27-mile path along the length of the river. It’s an ambitious goal given that the river runs through so many neighborhoods and is a source of great interest for so many businesses, nonprofit organizations and individuals — as well as a growing number of private development projects. For these reasons, we believe the Chicago River Trail coalition will serve as a key element in the development of the trail. The coalition serves as an important forum where members identify challenges and opportunities and collaborate to address them. Recently, the coalition met with developers (photo below) to ensure that their developments include separated paths for people walking and biking — and support the larger vision of a continuous Chicago River Trail. As Chicagoans demand more off-street trails, opportunities exist to leverage ongoing development near the river and create a trail system that benefits communities all along the river and across Chicago. Projects under discussion were Lincoln Yards, the Salt District and the 78 megadevelopment in the South Loop. We’re pleased developers say these projects will include trail separation, safe connections for people walking and biking, and important transit upgrades. 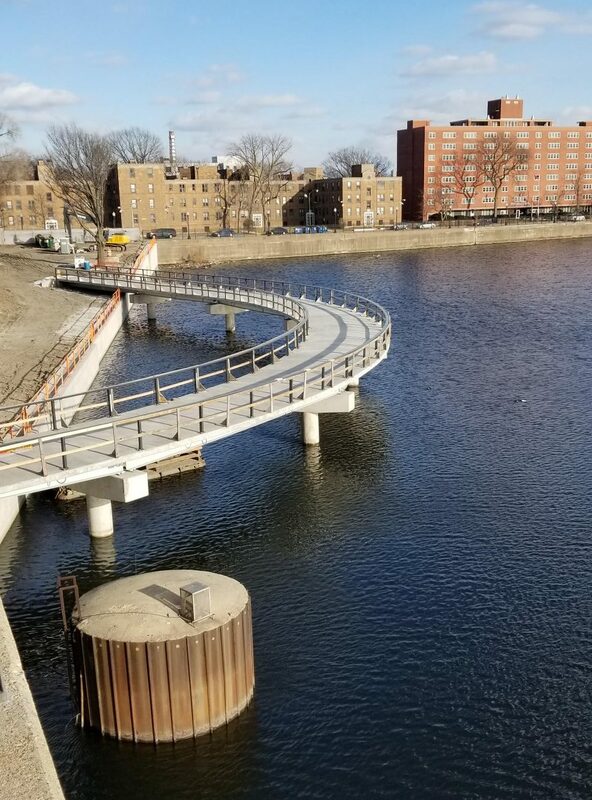 While it’s exciting to know that trail projects are included in these developments, let’s keep in mind that these trails are only useful if residents have safe and easy access to them and if these newly-created transportation benefits can be shared equally. We also recognize the importance of getting the trail design correct up front, which means separated paths for people walking and biking. Once a trail is built, it’s not easy to make changes — as demonstrated by the decades of persistent advocacy it took to bring trail separation to the Lakefront Trail. The South Branch Framework Plan, recently released by the Metropolitan Planning Council and the South Branch PAC. Plans for El Paseo Community Council, which is being led by El Paseo Community Garden. Active Trans’ project to relieve congestion for people walking and biking on the Riverwalk/Upper Wacker Drive. A plan to develop a 17-acre floating park in Goose Island known as the Wild Mile Chicago. An update on the development of trails at Lathrop Homes (pictured at top) which runs south and north of Diversey Avenue. Active Trans’ project to develop concepts for connecting the 312 River Run Trail at Belmont Avenue to the trail at Lathrop Homes. The completion of the Manor Greenway, an on-street connection between Lawrence and Montrose Avenues. The ground breaking of the Lincoln Village Bridge, which is scheduled to be completed in the fall of 2019. Also at the recent meeting the river trail coalition formed three committees that will work on addressing connections along specific areas of the river: South Branch, Main Branch and North Branch/North Channel. If your organization would like to join the river trail coalition, please contact Steve Simmons, (312) 216-0472, steve@activetrans.org. Stay up-to-date on the latest developments by joining the campaign for a continuous Chicago River Trail.